Everyone’s all excited about the Dr. Who Christmas Special, aren’t they? It is not surprising as this tradition has spanned generations. The holidays are just more exciting with something additional to look forward to. And when it comes to Dr. Who, it is not only the Doctor and his companion that piques the interest of viewers. If anything, the TARDIS has gotten so much more attention from fans all over the world. How can one not want a TARDIS of his own? This seemingly innocuous police call box is a world of wonders inside. Your very own time machine. While it is highly unlikely that we will see a true to life TARDIS that can travel in time and space, we do see a lot of TARDIS lookalike things on this earth. Not so long ago, we featured a TARDIS fridge that is actually a real working refrigerator modded by a true blue Dr. Who fan. 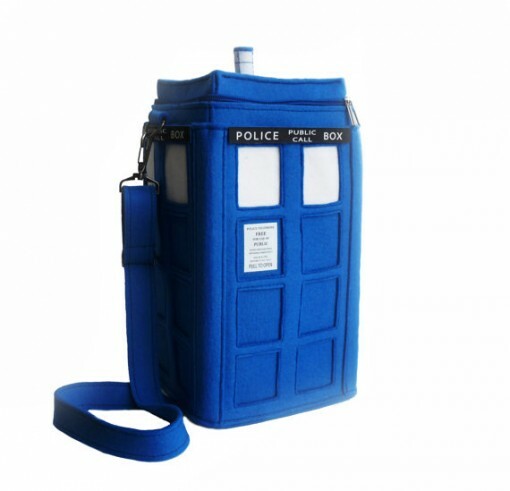 This time, we are looking at something more portable: a TARDIS bag. This bag is the brainchild of Etsy user krukrustudio, who recently listed it online. It is made of felt – color blue, naturally – and looks just like the time machine that the Doctor uses on a regular basis. The TARDIS bag measures in at approximately 13.8 inches high and 7 inches wide. That should be enough to carry what you need for a day out at the mall or the park. It might even be able to accommodate your small tablet! The TARDIS bag also has an adjustable strap, a zipper to ensure that your belongings are secure, and an inner zipper pocket. The last spec is a welcome one, especially if you are like me, whose bag always seems like a infinite well. All the cool things being said about the TARDIS bag, we have to face reality and take a look at the price. It’s a hefty USD180. Yes, very very steep in my opinion. And since it ships from Russia, you will have to pay an additional USD28 to get it to your doorsteps. I don’t know…as much as I am tempted by the thought of carrying a TARDIS bag around, the price is something I cannot justify. If you want to get it, hurry as there is only one piece available. Buy the TARDIS bag here.